If you want to be the biggest stud at your next Halloween or 70’s themed party then you need to have the hippest duds you can find. Back in the days when disco ruled the radio, all the coolest cats always went out in their favorite leisure suits. It’s time to step up your game and we can help! Check out this Orange Leisure Suit. Once you pop this bad boy on you’ll have the confidence of a lion while also being as charming as a storybook prince. When one wears a leisure suit they feel loose enough to boogie on the dance floor while also looking classy enough to get into the grooviest nightclubs. You’ll be sure to stand out if any of the other disco dudes decide to copy your sleek style when you have this bright orange beauty. This suit is a simple two-piece complied of a matching jacket and pants. The simplest things in life are often the best! If you want to spruce up your 70’s inspired look then take a look through our accessories. We’re sure you’ll be able to find a dynamite wig and the perfect pair of dancing shoes. Add a gold chain and you’ll be more than ready to hit up the party scene. 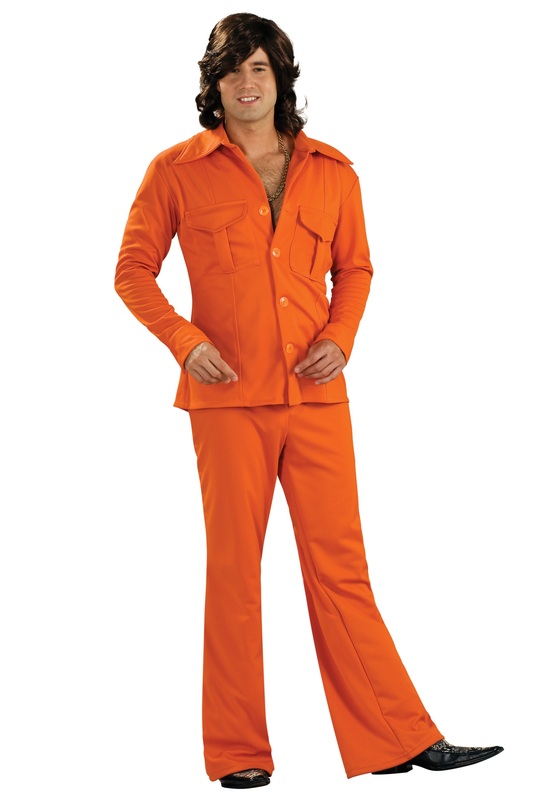 If you’re ready to be the grooviest guy this Halloween then you need to get your hands on this Orange Leisure Suit. You’ll be out of sight when you walk through the door and make your way to the nearest dance floor!